39g of Dried Mango is only 120 calories! Score! Hi there! How was your weekend? Mine was AWESOME… because I spent it in the garden, getting my hands dirty and planting veggies! Pix later this week. 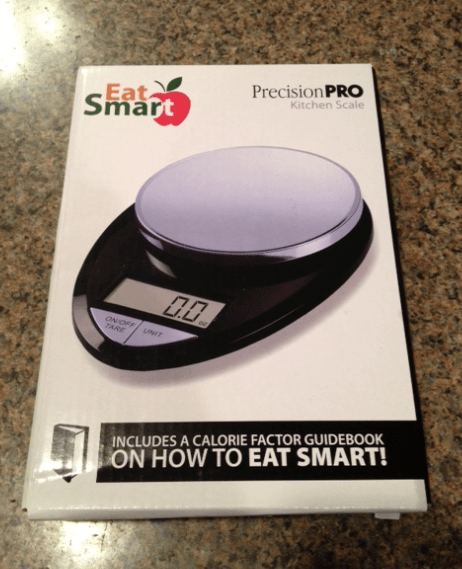 Today, I’m delighted to review the EatSmart Precision Pro Scale and give you a chance to win one of your own! But first, here’s the stuff good bloggers should always admit: Disclosure: I did receive a complimentary scale from EatSmart for this review.Remember how I was getting frustrated with Points Plus and said I would be starting to weigh out my portions? I knew I needed a scale to make sure I wasn’t fudging any numbers. 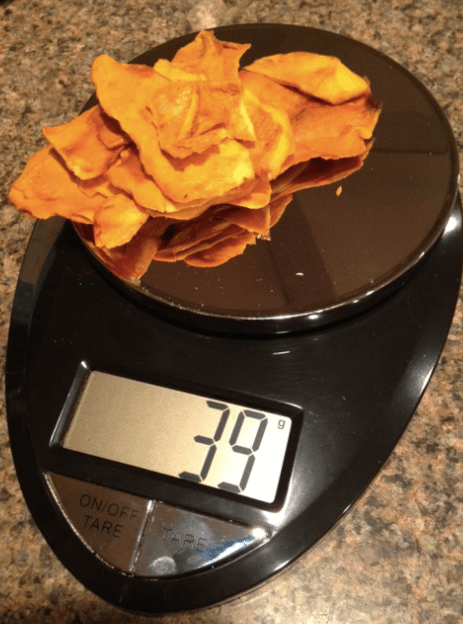 I like to eat things like dried mango, and the calorie count is measured in grams – for example, 38 grams is 120 calories. How would it even be possible to measure grams without a scale?! between different measurements, to turn it on and off, etc. It has a nice, sleek look that would match any decor well. It comes with batteries (so convenient – I loved that), and has an automatic turn off after 3 minutes if you get busy doing other things. The display window has big, easy to read numbers and letters – perfect for people like me who always lose their glasses. Wipes clean with a damp rag – no need to wash, and the plastic material seems like it would be easy to clean up should you have a big spill. It does the trick easily and measures accurately, which is the most important thing! Affordable price. On Amazon, this scale is priced at $25.00 and has over 3,000 5-star reviews. WOW – feedback like that doesn’t lie. The stainless-steel looking buttons show finger prints pretty easily. If you want to keep it out on the counter top, you’ll have to be a little more maniacal about wiping it down more if you’re a spaz like me 🙂 But, most normal people won’t even notice, so carry on! Overall, the PrecisionPro Scale is a GREAT choice if you’re looking for a food scale. It also comes with a 2 year warranty, which is a big deal in today’s economy. If a company is willing to back something up with a long warranty, you know it’s a quality product. Check out EatSmart’s website for more details – how cute is this red retro scale? It totally reminds me of something Rachel Ray would have in her kitchen. Want a chance to win your very own EatSmart scale? It’s super easy – just leave me a blog comment telling me WHY you want to win – and then when you do that, you’ll unlock five more easy entries! Make sure you use a real e-mail address when you comment so I can contact you if you win! This giveaway is for US residents only. Also – for every new Facebook “like” that Eat Smart gains in April, they’ll donate .50c to the Susan G Komen Foundation. So even if you don’t want a scale – “like them” to help raise money for breast cancer research. I use rafflecopter for my giveaways, so I will randomly choose one winner on the morning of Tuesday, April 10. I think that’s all! Let me know if you have any questions – and GOOD LUCK! This entry was posted in Food, Giveaway, Review and tagged awesome products, blogging, cooking tools, cooking utensils, eatsmart scales, enter to win, food scale, free stuff, giveaway, healthful cooking, healthy choices, kitchen scales, kitchen tools, measuring your food, portion sizes, precision pro scale, review, review product, your chance to win. I love EatSmart and the people behind EatSmart. And I love my kitchen scale! My mom loves it too so I’d love to win it for her because she’s trying to measure everything now, and this scale would obviously make it more precise! I have not tried easy smart but they seem like a great product that only makes the whole weight loss this that much easier. It’s rather pretty. Have a great week sweetie! I bake a lot, and many of the recipes I’d love to try are in weight measurements — and I don’t yet have a scale. This one would be great! 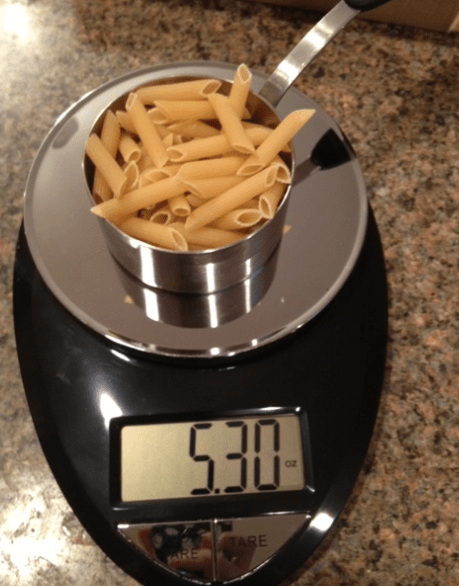 I’d LOVE a new kitchen scale….I need to lose weight and I know measuring seems to work best for me. A new scale would motivate me to start down the right path again! I would love to win the scale so I could become ‘honest’ about the amount of food I am eating as well as educated about portion size after being able to measure/weigh what I am eating! I have been using an analog scale and I doubt it is as accurate. I have fallen into the “eyeballing” trap and need to get out of it. Let you know later what my loss is for last week. Keep up the good good work. Would love to win an EatSmart scale!! I’m not too accurate when gauging the amount of my food. This would make it so much easier and it is such a great looking scale. I would love it on my counter! I just purchased an EatSmart bathroom scale that is excellent! I’m always wary about bathroom scales as they are usually all over the map. I finally chose this one and am very happy with it, especially since I weighed on it just after weighing at Weight Watchers and it was spot on! Can’t get better than that. Yay Eat Smart! I love your idea about weighing everything, it’s got to be much better than trying to guess. I would like to be able to convert some family recipes in Italian from grams to cups, so that I can bake the almond cake my cousin made for us in northern Italy. I have had the same old scale for over 10 years, I could so use a new one and this one looks much better than mine!! Thanks for the review and giveaway. This would be great for recipes that ask for a weight, the other day a recipe I used asked for 3/4 lb of pasta and I just eyeballed it. This would make my cooking measurements accurate! I haven’t ever tried an EatSmart Scale but I can imagine that it would be very useful in the kitchen and for portion control! I would love to win this eatsmart scale because I am currently making changes in my life and trying to create healthier eating habits to reach a healthy weight. My older brother is such an inspiration for me right now, he lost 200 lbs over a span of 1 and 1/2 years and one of the keys he told me was weighing out and measuring all the food he prepared. I have failed so many times not using this method, so I now feel compelled to try, and this scale would be very helpful! Love the blog and the message you are sending out too boot! Alyssa, thank you so much! I will surely get a lot of use out of this scale!